Special maps (such as using triggers) should be able to use an improved match setup setting, other than the Scenario currently used. the map should eventually not be selectable in a multiplayer game. trigger-maps.patch​ (5.8 KB) - added by fabio 3 years ago. 3013.2.diff​ (5.4 KB) - added by stanislas69 3 years ago. 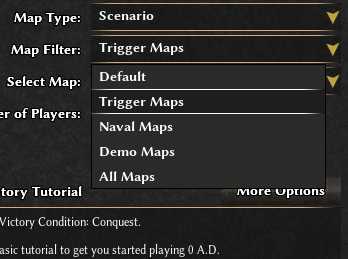 The attached patch add the new map filter "Trigger Maps", along "Naval" and "Demo". It also add the trigger Keyword to trigger maps, as well to the two tutorials that don't use triggers but use a dedicated ai. Why do we need all these gamesetup changes? There is no map in vanilla 0 A.D. which requires those change, is there? Scenario maps already are special maps and we definitely need to fix some things in the gamesetup for scenario-maps. Hiding information seems to be plausible. Why do we need all these gamesetup changes? As I said in the first post, and mainly to avoid users tampering/seeing settings that should not be changed to avoid ruining the intended play experience. E.g. if you change the AI of the tutorial map to Petra you won't get the tutorial. There is no map in vanilla 0 A.D. which requires those change, is there? Yes, there are some maps, see my patch. With regards to the trigger-maps patch. Why do we need that, can't we just use Demo maps? Your previous question is an answer to this one... many players are unaware there are such maps. Adding a filter for them make clear their availability. Some maps already have naval + demo keywords, but I agree that maybe demo map should not be listed also in trigger or naval maps, since demo maps are not intended to be played. many players are unaware there are such maps. Adding a filter for them make clear their availability. Nah, its fine. IMO a naval trigger demo map can be listed in all three cases. The logic should be as simple as possible. I run a grep through all maps and those are indeed all correct changes. So rebase that gamesetup.js thing and commit it. Why not just alter the map settings? Currently, these settings are only used as the default, which is not that good. It would be better if the map could force certain settings, or could force settings to be in a certain range. Leaving a setting undefined would leave the choice to the player over some default values, setting a key to a certain value (like "PopulationLimit": 200) would fix that setting and disable user choice. But setting it to an array (like "PopulationLimit": [50, 100, 200]]) would give the user a choice between these values. Of course, the GUI should still be simple enough, and the population limit probably should be set per player. So either this should be a global variable, or all arrays of all player settings should be equal in length in this case, and thus allow a "low", "medium" and "high" setting with different max pop per player. Backlogging due to lack of progress. Backlogging effectively since it didn't go to backlog last time. Add maplist filter for maps that come with triggerscripts. Patch by fabio and Stan, refs #3013. Thanks for the patch. It should have been rebased and committed 5 months ago by me after I changed the filtercode. Changed the patch to show triggerscript maps by default too. Remove the trigger keyword from these maps as they either use the Tutorial AI for scripting or use a script only to place entities on load, refs #3013. Move tickets to Game Setup as UI & Simulation got some sub components.